BETHESDA, Md., June 30, 2017– ROSS Management Services, a leader in multifamily property management in the Mid-Atlantic region, today announced that ApartmentRatings.com has named 14 ROSS communities as Top Rated in 2016 for outstanding resident satisfaction scores. In order to qualify for the awards, the communities had to receive a recommend score of 70 percent or higher and be in the top 5 percent of communities listed on ApartmentRatings.com. ROSS’s top scoring community was Spring Parc Apartments, which achieved a recommend score of 96 percent. Next was Overlook Apartments, which earned a score of 92 percent. Eight of the communities – Spring Parc, Charlestowne North, Cole Spring Plaza, Colvin Woods, Seven Springs, Park Vue, EOS-21 and Crestleigh – have now won the award four years in a row, while Overlook has received the honor for three consecutive years. The Heritage at Old Town also won the award for 2013 and 2014. In order to be deemed a Top Rated property, the apartment communities needed to also have at least 10 total reviews, and five in 2016. ROSS Companies, founded in 1983 in Bethesda, Md., is a recognized leader in multifamily acquisitions and investment, development, property management and renovation. With a managed portfolio of more than 11,000 apartment homes in 37 communities, the privately held company is one of the most active multifamily real estate firms in the Mid-Atlantic region. ROSS Companies is comprised of three affiliates – ROSS Development & Investment, ROSS Management Services and ROSS Renovation & Construction. In 2016, ROSS Development & Investment is celebrating its 33rd anniversary and ROSS Management Services is celebrating 28 years in business. In April, ROSS Management Services was honored for the third straight year with a National Resident Satisfaction Award from SatisFacts. 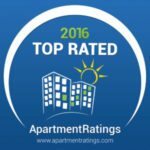 In 2016, 12 ROSS-managed apartment communities were awarded the Apartment Ratings’ 2015 Top Rated Award, reflecting ROSS Companies’ unwavering commitment to customer satisfaction. These annual awards recognize communities with outstanding resident satisfaction ratings as measured on ApartmentRatings.com. For more information about ROSS Companies, visit TheRossCompanies.com.